Teer Coatings Limited proudly supported the Huddersfield University Formula Student Team, in the Formula Student event held at Silverstone in July 2009. For those who are unfamiliar with the event, the Formula Student is seen as the breeding ground for the Formula 1 Engineers of tomorrow. This year teams from a 105 universities, spanning 23 countries took part in the event, competing in 5 racing categories. 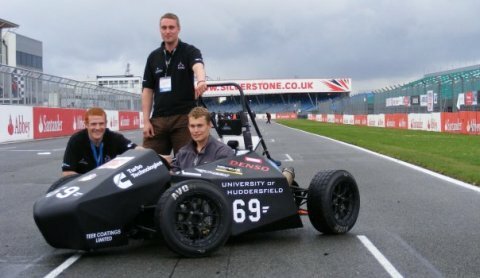 Teer Coatings applied one of their range of solid lubricant coatings – found on parts currently used by leading Formula 1 teams – to help give the team from Huddersfield University a competitive advantage. We would like to take this opportunity to congratulate them on their performance, and to wish them every success in the future.